OBD Aftermarket size was estimated at over USD 500 million in 2017, growing at a CAGR of over 17% from 2018 to 2024. The OBD aftermarket is projected to exhibit a lucrative growth between 2018 and 2024 due to the significant investments from automotive aftermarket service providers for developing modern telematics platforms. A huge growth in this sector has accelerated the need to implement stringent vehicle emission norms and standards to control the increasing automobile emission levels. The pollution control authorities, such as the California Air Resources Board (CARB), U.S. Environmental Protection Agency (EPA), the Society of Indian Automobile Manufacturers (SIAM), and many others, are actively formulating regulations and emission norms to set the limits for the air pollutants released from vehicle engine components. The regulatory authorities in various countries have also mandated the OBD II compatibility requirements for all petrol and diesel vehicles. The OBD system helps the owner or the car technicians to diagnose and fix problems related to the engine’s major components and improve the vehicle reliability while reducing the fleet operations cost. The implementation of fleet management software with OBD telematics monitors driving behavior, evaluates the overall condition of the vehicle, and offers additional services such as maintenance reminders, roadside assistance, and crash notifications. 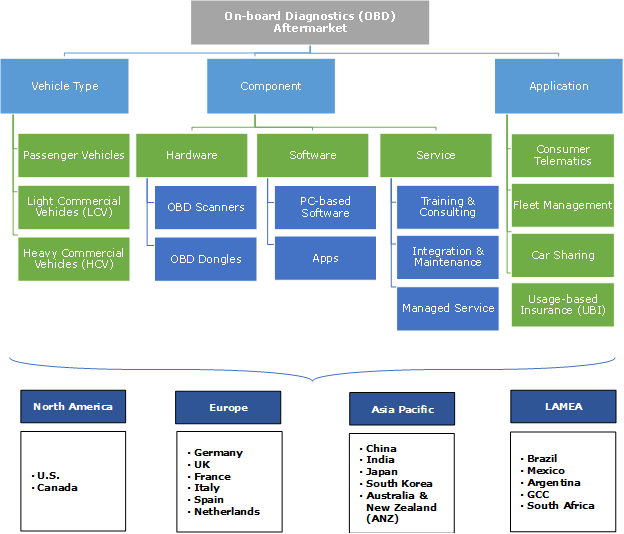 All such OBD implementation benefits are expected to drive the growth of the global on-board diagnostics aftermarket during the forecast timeline. The software market is estimated to register the fastest growth between 2018 and 2024 with a CAGR of over 20% in the OBD aftermarket due to the rapid adoption of OBD telematics platforms for commercial vehicles. The increased penetration of smartphones and a widespread deployment of cloud technology are the driving forces behind the market growth. The cloud-based platforms enable users to easily access the diagnostics data as these platforms provide a simple and cost-effective way to manage the massive amount of data generated from OBD devices. A cloud-native approach reduces the dependency on traditional PC-based OBD scanning models, thereby fueling the demand for handy vehicle maintenance and diagnostics apps. The Usage-Based Insurance (UBI) application is expected to exhibit an excellent growth rate of over 20% in the OBD aftermarket during the forecast timeline as drivers can effectively qualify for the criteria for usage-based insurance schemes depending on their driving speed, vehicle conditions, and driving habits. OBD telematics is helping insurance providers and fleet management companies to gather the useful vehicle health data and driver related data to assess the driving mannerisms to promote safe driving practices and create awareness of better driving behavior, which will reduce accidents. The implementation of UBI also paves the way for insurance premiums based on individual risk profiles and enables the insurance providers to reward or penalize drivers according to their driving behavior. The Asia Pacific OBD aftermarket will experience the fastest growth between 2018 and 2024 at a CAGR of over 20% due to the significantly increasing vehicle production, particularly in China, India, and Japan. Also, the government initiatives in the region to issue stringent emission norms to combat rising levels of air pollution are expected to contribute to the growth of the market over the forecast timeline. The region also witnessed a huge demand for OBD solutions in electric cars to have a better control over the vehicle’s engine and other electrified components. According to the China Association of Automobile Manufacturers (CAAM), in January 2018, the country’s production and sales of New Energy Vehicles (NEVs) recorded 40,569 units and 38,470 units respectively. 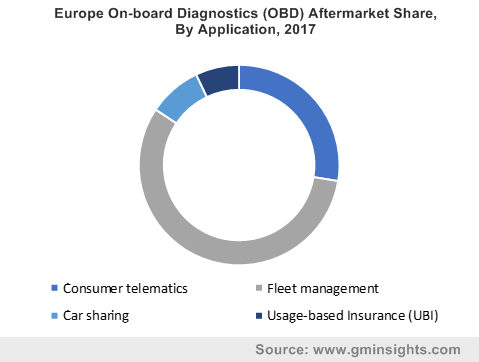 Europe held the second largest share of over 22% in the on-board diagnostics aftermarket in 2017 due to the early adoption of OBD II standards in the region along with the rapidly-growing popularity of UBI. Germany, the UK, and France are the major automotive manufacturers in the region along with an extensive passenger vehicle population. The European Union is also taking efforts to bring vehicle type-approval reforms in the region in association with all the EU members. Due to such favorable initiatives, the region is expected to hold the second largest share of the OBD aftermarket by 2024. The competition in the on-board diagnostics aftermarket is characterized by various strategic initiatives such as new-product development and partnership adopted by the global technology companies and telecom service providers to deliver innovative products and services to cater to their customers’ requirements. For instance, in June 2016, Intel, Chunghwa Telecom and SanJet Technology entered into a joint collaboration to power-connected transport platform solution. Under the partnership, the companies combined their existing capabilities to deliver UBI with customized insurance offerings based on driving behavior and car usage. Similarly, in July 2018, Bosch introduced new automotive diagnostics scan tools, ADS 325 and ADS 625. The new set of tools are embedded with several features such as built-in Wi-Fi, Dual 5MP front and rear cameras, HDMI output, docking, and charging station to enable technicians to easily diagnose the complex vehicle issues for passenger trucks and cars. Some of the key players operating in the OBD aftermarket are Automatic Labs, Continental, Tom Tom, Magneti Marelli, Danlaw, CalAmp, Metromile, ERM Telematics, Mojio, Intel, Xirgo Technologies, Azuga, Verizone, Geotab, Vector Informatik, AVL Ditest, Autel, and Bosch Diagnostics. The early versions of diagnostic systems came into the picture in 1960s when Volkswagen introduced on-board computer system to scan its engine control systems. These systems provided limited information regarding the problem in vehicle’s engine and its sub-components. Also, the diagnostic information provided by OBD systems was not enough to find the reason behind the vehicle’s malfunction. This increased the need for more efficient diagnostic systems, such as OBD I and OBD II, which were used in mid 1990s. In 1994, the CARB issued OBD II specifications and mandated the OBD requirements in all the Light Duty Vehicles (LDV) and Heavy-Duty Vehicles (HDV). The OBD II compatibility and standards have been adopted by various government institutions around the world to monitor vehicle emission levels and facilitate better vehicle diagnostics.